Even before the release, Rajnikanth and Akshay Kumar-starrer, Robot 2.0, has managed to make headlines. Even before the release, Rajnikanth and Akshay Kumar-starrer, Robot 2.0, has managed to make headlines. Once again, the behind-the-scenes video of the film has caught the attention on the internet. The highly anticipated film has intrigued the fans with every little detail that has been revealed yet. In this 2 minutes video, which is a part of a documentary of the making of the film by BBC news has gone viral. 2.0 is addressed as the most expensive films of Bollywood till date with a budget of Rs 400 crore. The larger than life sets in the clip promises a mind-blowing experience in the theaters. 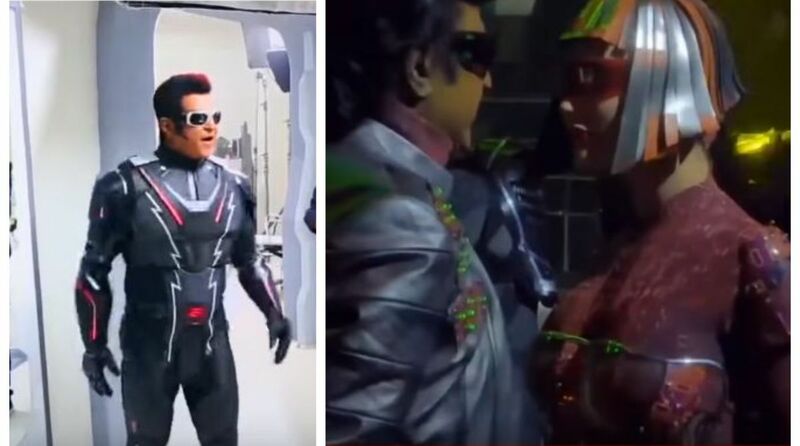 The actress of the film, Amy Jackson could be spotted rehearsing her dance moves and we also get a glance of superstar Rajnikanth. Earlier, the unreleased teaser of the film was leaked on the internet. The video of the teaser was speculated to have been captured in London or Dubai during the public screening and thereafter released online. Robot 2.0, which had a different release date earlier has been scheduled for 29 November to reportedly avoid a clash with Aamir Khan’s Thugs of Hindostan.